Comedies usually appeal to me if they are absurdly funny - think Pee Wee's Big Adventure or There's Something About Mary - or extremely intelligent and witty -think Annie Hall or The Apartment. If both types happen to intersect, a rarity, then you really have a winner. Examples of this include The Big Lebowski or Some Like It Hot. Losers are movies that fail to be consistent in sustaining any of these stylistic aims. That's why unlike many of the critical world at large, I found Pineapple Express and Tropic Thunder to be so weak. They were uneven in tone and failed in sustaining their humor over the length of the movie. That is also why I was caught by surprise when I viewed The Promotion, directed by Steven Conrad. This movie got an extremely limited theatrical release, and yet is consistently funny, honest, and often profound in its sympathetic view of middle management in the world of grocery stores. Doug Stauber (Seann William Scott) is an assistant manager at Donaldson's, a grocery chain. His girlfriend, Jen (Jenna Fischer) works for a handsome doctor (Bobby Cannavale) who keeps calling him "Guy" every time they run into each other. Doug's manager, Scott (Fred Armisen) tells him he's a shoo-in for manager of the new Donaldson's opening nearby. So Doug convinces Jen they're ready to buy a house. 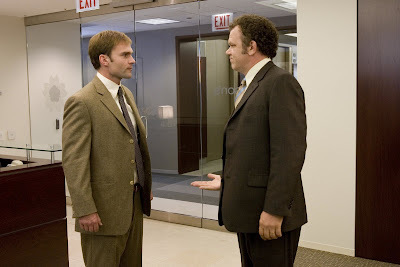 Then Richard Welhner (John C. Reilly) transfers in from a sister store in Quebec. Richard is likable, but a bit of a failure in life. The recovering addict is married to lovely Lori (Lili Taylor), who he met on a Christian mission. This after past lives in a biker gang, and other mysterious dead end endeavors hinted at by the gigantic KISS tattoo on his chest. Richard sees the new management position as his redemption. And the motivational tape he listens to on his walkman never lets him forget he should stay on the right track,despite his amazing inability to succeed at that pursuit. The strong cast is one of the highlights of the film. Reilly (Boogie Nights) is his usual solid self, giving poor Richard a list of quirks without ever descending into self-parody. In one scene he tries to convince some higher ups that he was unaware of the joke when he saw a poster in the deli rewarding an employee "for cutting the cheese". He claims that in Canada the expression does not have a double meaning. It just means "cutting actual cheese." The usually clownish Scott (American Pie) is surprising here, playing the straight man to Reilly's antics. As Doug, he is a meek man who often follows instructions by a manager, which will be countermanded moments later if the manager suspects "The Board" may disagree with his solution. Doug submerges his day-to-day frustrations in pursuit of a goal that may not even be sufficient to satisfy his ambitions. As Doug and Richard compete for the position, writer-director Conrad never sides with one man or the other. Both are decent human beings with aspirations beyond their pathetic jobs. Both are equally capable of pulling some vindictive stunts to keep the other man down. And Conrad, who is better known as a writer (The Weather Man, The Pursuit of Happyness), respects each man's stamina in their bureaucratic nightmare of a job. Conrad is a promising director, and I'm sure this movie will attract a growing audience in the home market, much like Office Space did. As Conrad confirms in a promotional featurette, The Promotion is a paean to the little guys, the Dougs and the Richards, who show up to work every day despite a thankless, Kafkaesque career. The Promotion is available on DVD today. Funny how we could view this so differently. While I appreciated the look at mid management, I felt this was not funny enough for a comedy and not dramatic enough for a drama. I was wishing the whole time that Alexander Payne had made it, instead; I think it would have been much better. Yeah, I've seen the opinions pretty divided on this one. But I related so closely to the situations and characters. My job previous to this endeavor was a middle management at a large bureaucratic service-oriented business (not groceries), and I can assure you, I went through just about every experience these guys went through. Luckily, I speak fluent Spanish so I avoided the "clam sauce" situation.